There are certain life events that are possibly the most important in anyone’s life and a wedding is surely one of them. Event Drapery can help create that memorable and stunning atmosphere with an effect that can’t be achieved in any other way. Whether you’re Draping an entire venue or simply enhancing the look of the altar, a specific wall, or entrance, the effect can make a huge difference to the appearance and atmosphere of your wedding venue. 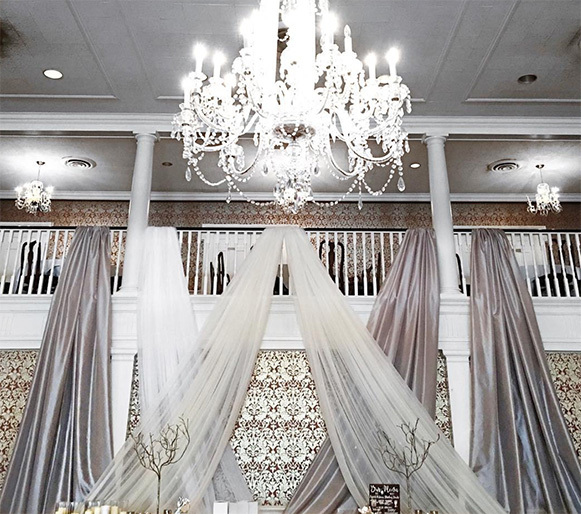 From Ceiling Treatments to Pipe and Drape, some brides say the event Drapery was the most important addition to their wedding. Whether you need Ceiling Treatments, Tents, Backdrops, and/or Pipe and Drape, It’s always a good investment to hire an experienced designer/installer for your Event Drapery, to offer a variety of options that are ideal for your requirements and your vision. 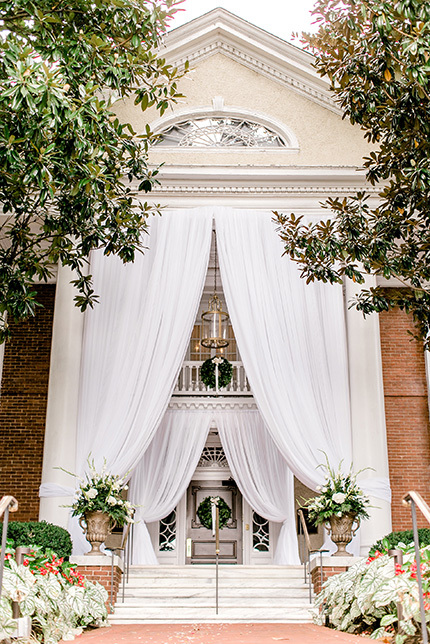 Your guests will find that drapery creates the perfect look for those areas you wish to highlight, like the bride and groom entrance and event areas. By using Ceiling Treatments and/or Pipe and Drape, Lusther Events will highlight those areas to stand out more beautifully, while truly creating an unforgettable environment. An outdoor wedding can provide you with great options that allow designs to get very creative! Our backdrops and Event Drapery can be that special touch that creates a “wow factor” that can’t be easily achieved in any other way. Whether you’re planning a ”simple and low budget” affair or shooting for the stars with an elaborate wedding designed for Royalty, our well-seasoned staff will provide a drapery experience that will create a striking environment to help make your day beautiful and last a lifetime. Backdrops are of prime significance and need to be chosen and designed carefully. You can select from metal frame backdrops, pillar backdrops, greenery and dramatic drapes in a range of colors to finish the expression of the wedding venue. In addition, it makes up for an amazing backdrop as part of your wedding stage or event decoration. Draping comes in a number of varieties, colors and fabrics. 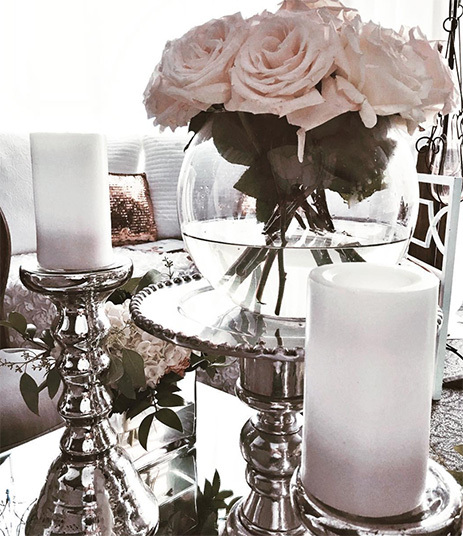 They can create the tone or mood of your entire event and compliment some of your wedding accessories if proper planning is performed in advance. Lighting can be used to spotlight the Drapery for a more dramatic effect. 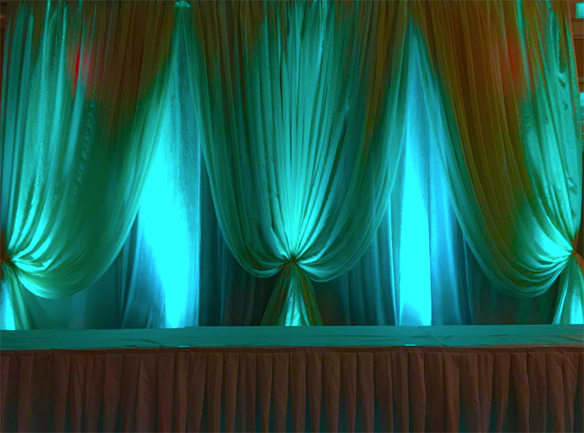 The proper lighting can light up the Drapes and draw the eye to the focal points and really highlight the main areas such as the entrance, bride and groom table and/or altar. Accessories like table jewels, table runners, a wishing well for gifts in envelopes and even serviette rings, can be complementary to the Draping as well. All of these items can be tied in to create a dramatic effect, even if your budget is limited. With proper planning, they can also provide you the flexibility to personalize your package based on your requirements. 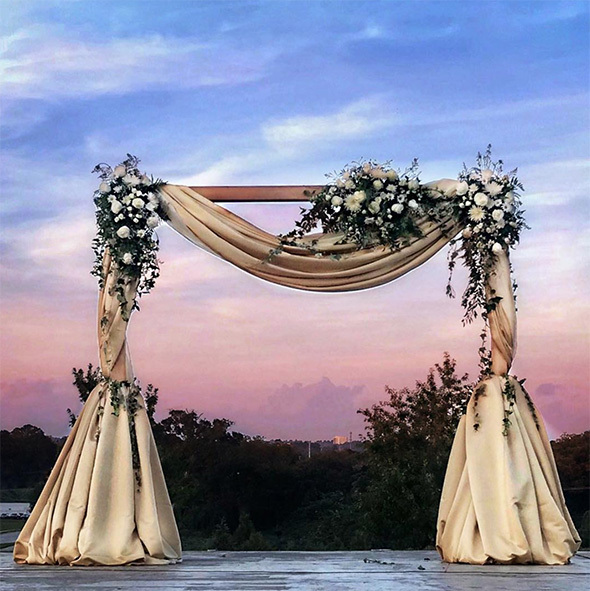 After all, this is your special day that you’ll remember forever, so you owe it to yourself to see how dramatic yet affordable it is to utilize Pipe and Drape for your wedding. If you need help or have questions, simply contact Caz Luther of Lusther Events and she’ll gladly point you in the right direction.